My absolute favorite thing about Thanksgiving is the fact that I give myself the permission to eat pumpkin and apple pie (yes, both. no judgements please) for breakfast the morning after. Since I’m not a huge fan of the typical Thanksgiving dinner itself, leftover pie in the morning is my foodie main event. Seeing as the calendar just turned to August, and I’m not really the patient type, I’m taking a stand. I’m serving pie for breakfast. Only this time it’s cherry pie. And, it’s in the form of oatmeal. Because, real pie is a treat and this oatmeal was designed to be enjoyed as an everyday item. While I sit in my cement encased city condo proud of the fact that I’ve managed to keep my basil pot alive all summer, I dream about someday owning a house with a large garden…something my more adult friends already do. And they usually spoil me rotten with all of the delicious things they are currently growing: tomatoes, eggplant, beans and cherries. Fresh, ripe cherries > just about anything. I think that using golden cherries in this recipe makes the dish seem more rustic. Rustic, being blog-speak for anything put together without much thought. Go on, try it next time you’re entertaining guests. Instead of serving a peach tart, you are serving a rustic peach tart. Oooh, Ahhh. So fancy and shabby chic at the same time. It works with just about anything. 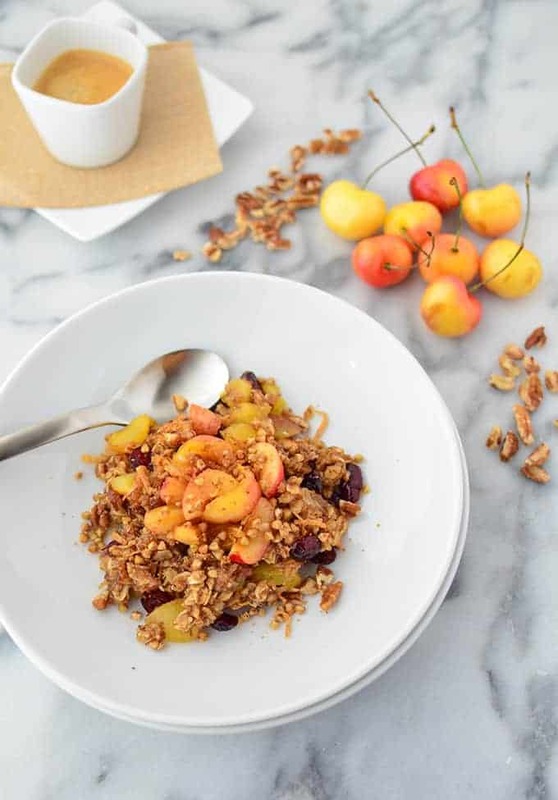 I adapted my classic baked oatmeal for this recipe, substituting in pecans, fresh cherries and dried cherries. And, although I haven’t had cherry pie in ages (I’m a loyalist to my apple and pumpkin), I imagine this is what it would taste like. Warm brown sugar oatmeal with juicy cherries in each bite. For extra crunch, I tossed in some toasted buckwheat groats for serving. If you know me, I cannot be trusted with a jar of buckwheat groats. I will find a way to toast and put them on just about everything. Just ask BL who had to hold an intervention when I tried to top last night’s enchiladas with toasted buckwheat groats. Step away from the groats. You’re welcome to use the term ‘oatmeal’ with this one, but feel free to omit the fact that it’s healthy. It’s the perfect sneaky breakfast- it tastes like you’re getting away with pie, with all the nutrition of a bowl of oatmeal. 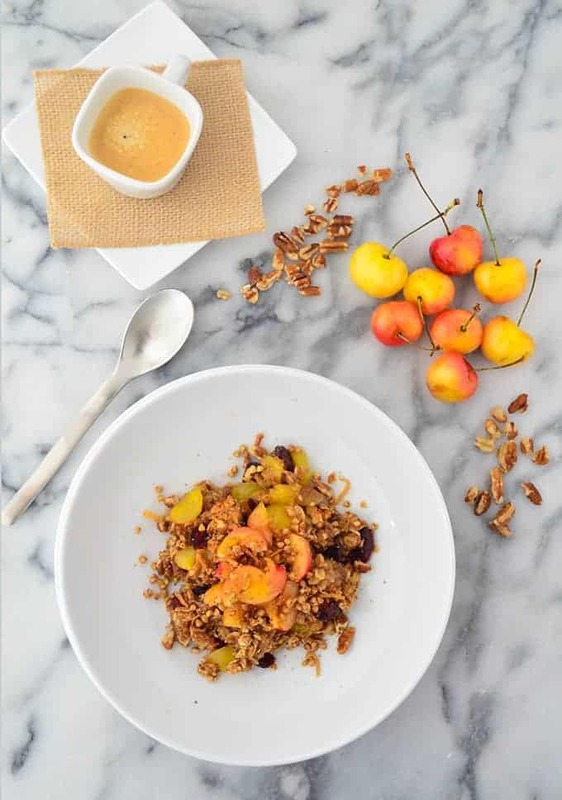 This twist on a classic baked oatmeal has pecans, fresh cherries and dried cherries and for extra crunch, some toasted buckwheat groats. Mix together the ground flax seeds and water. Let gel for ~5 minutes. Add the oats, brown sugar, cinnamon, baking powder, and salt. Mix together. Add the maple syrup, butter, cherries, pecans and dried cherries. Mix together and spoon into a lightly greased 8×8 casserole pan. Bake for 25-30 minutes until golden brown and hot. Enjoy as is or with a little unsweetened almond milk or yogurt. Ahh I fantasize about having a garden… not done with my city living yet though, maybe in a couple years. This looks delicious, I need more friends that have gardens to spoil me with homegrown treats, I’m jealous! I’m actually not either- that’s why I love baked oatmeal so much! The texture, in my opinion, is much better than regular cooked oatmeal. Hope you try it! If you like it, I also have another one on my site with walnuts and strawberries. Cherry Pie Oatmeal sounds amazing! 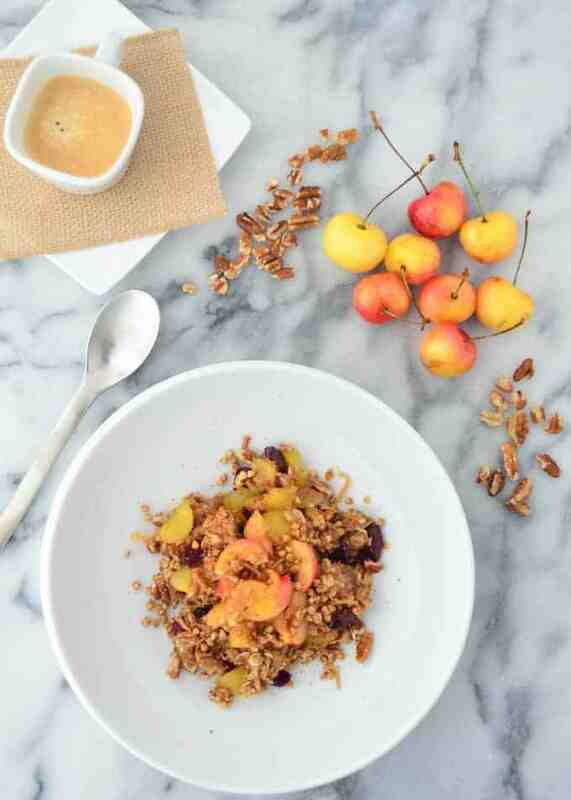 I love cherries, love pecans, love maple syrup and love oatmeal, so this is perfect!! It is amazing 🙂 Thanks for the comment! Alex…you are a genius! I’m over here in rainy England enjoying a bowl of your wonderful recipe and its entirely delightful! I replaced cherries with apple. It’s turned out as what we’d describe in England as an ‘Apple Crumble’…and probably the best Apple Crumble I’ve had! Thank you so much Julia! I am glad you enjoyed it!